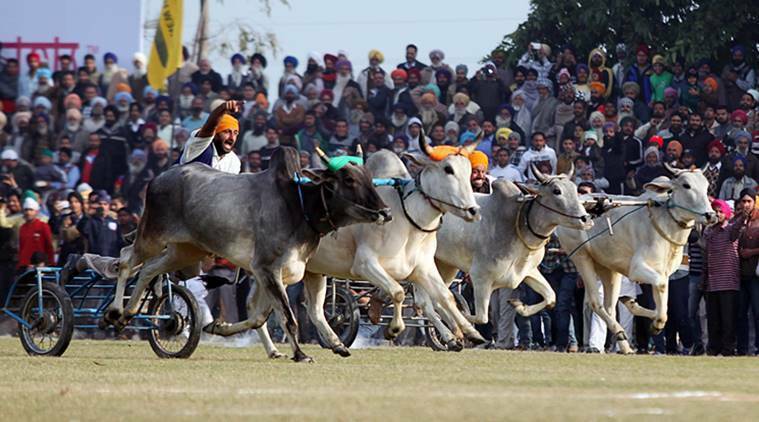 Clearing the way for the bullock cart races to return to Kila Raipur rural olympics, the Punjab Vidhan Sabha Monday passed Prevention of Cruelty to Animals (Punjab Amendment), Bill, 2019. The Punjab government, after taking a cue from the Tamil Nadu legislation that allowed Jallikattu bull taming sport in 2017, too decided to bring the Bill in the Assembly. The Bill states that “considering the important role played by the traditional rural sporting event and fair, which takes place at Kila Raipur (Ludhiana), towards promoting the spirit of games and sports, and enriching the cultural heritage and tradition of the state of Punjab, which is also a great source of entertainment, especially for rural Punjab,” the government of Punjab have decided to bring the legislation. The bullock cart races were banned five years ago after Supreme Court, in Animal Welfare Board of India vs A Nagaraja, found that the conduct of “Jallikattu” as prevalent in Tamil Nadu, as also bullock cart racing, was in violation of the provisions of Central Act of 1960, particularly Sections 3,11, and 22. As Tamil Nadu government brought a resolution for amending the Act, the organisers of Kila Raipur sports demanded a similar legislation in Punjab Assembly too. They argued that animals were not subjected to any cruelty during conduct of the games. The “bullock athletes”, they said, were rather looked after well, fed almonds, massaged and treated with care to prepare them for the races. Kila Raipur organisers have been waiting for the government to bring the legislation. The much awaited sports event has been postponed at least thrice this year. It was earlier planned from February 2, then was postponed to February 22, but with the Vidhan Sabha session extended, the organisers have now announced March 8, 9 and 10 as the new dates. Animal Husbandry Minister Balbir Singh Sidhu presented the Bill in the Vidhan Sabha. It was passed in two minutes, with Aam Aadmi Party legislators staging a walkout to protest against passing of Punjab Legislative Assembly (Salaries and Allowances of Members), Amendment Bill, 2019. SAD-BJP legislators had very thin attendance.